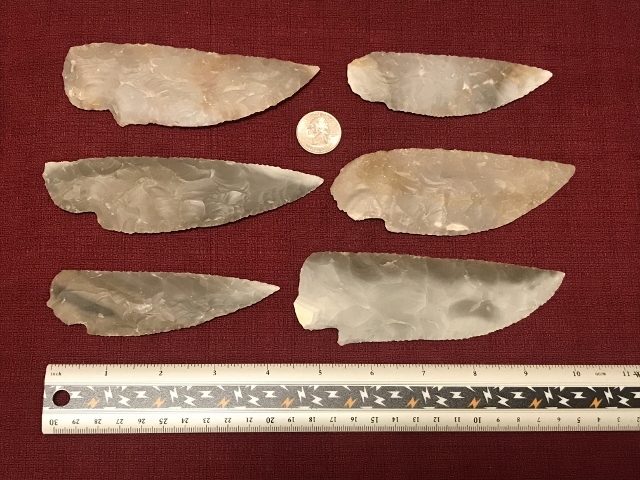 Finished knife blades made from Texas flint. Blade offered in 3 sizes. These are gray to tan in color, finished and ready to mount. Mountable standard knife shape, with tang for hafting. Our blades are well-flaked with a good width to thickness ratio -- not like those imported Indian blades. Mount with wood, bone or antler handles to produce fine collector's knives. Small 3 to 3/12 inch approx. blade length. $15.00 ea. Large 3 1/2 to 4 1/2 inch approx. blade length $18.00 ea. Deluxe 4 1/2 to 6 inch approx blade length $28.00 ea. Use drop-down menu to select the size you want.